Not sure what to read during your devotional time each day? Stay committed to growing spiritually with daily readings, personalized reminders, and a calendar to track your progress. Sarah Young’s first experience of the Presence of God in a tiny Alpine village in France led her to life as a missionary for Him. Decades later, after many years of writing in prayer journals, she wanted to document her communion with His Presence in a new way. Young desired to have a dialogue with God, not the one-way communication of her journals. In a step of faith, Sarah sat down with pen in hand and listened for God, ready to write down whatever He told her. Reflecting Psalm 46:10 “Be still, and know that I am God”, Jesus Calling, is a powerful devotional based on Young’s journey to deeper intimacy with the Savior through her personal meditations with God. With her eyes always on the inerrant Word of Scripture, Young’s writings are from Jesus’ point of view. The first person singular (I, Me, Mine) always refers to Christ while “you” refers to the reader, so that the perspective is that of Jesus speaking directly to you. 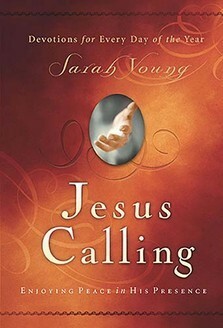 The messages of Jesus Calling bring each reader deeper into the presence and peace of Jesus Christ. After many years of writing her own words in her prayer journal, missionary Sarah Young decided to be more attentive to the Savior's voice and begin listening for what He was saying. So with pen in hand, she embarked on a journey that forever changed her—and many others around the world. In these powerful pages are the words and Scriptures Jesus lovingly laid on her heart. Words of reassurance, comfort, and hope. Words that have made her increasingly aware of His presence and allowed her to enjoy His peace. Jesus is calling out to you in the same way. Maybe you share the author’s need for a great sense of “God with you”. Or perhaps Jesus seems distant without you knowing why. Or maybe you have wandered farther from Him that you ever imagined you would. Here is a year’s worth of daily readings from Young’s journals to bring you closer to Christ and move your time with Him from monologue to a dialogue. Each day is written as if Jesus Himself were speaking to you. Because He is. Do you hear Him calling?